I was cleaning some old stored stuff when I stumbled upon various materials from some companies I've joined in the past and a post idea came to mind so I took a pic. I've never been good with sales and anything related to it such as multi-level marketing (MLM) or network marketing. This is somewhat ironic since my work online also involves social media marketing and some of my first jobs involve sales in a way. One more major irony is that I once earned almost 50,000 pesos from sales referral while working in a call center company a few years back. The account is not sales related and the commission was paid as a side gig. 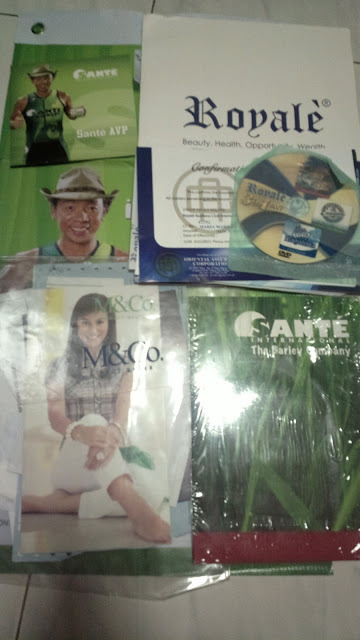 While I'm never good with sales, I did try selling online a few years back through the now defunct sulit.com.ph. It's new brand name - Olx is hardly recognized these days. I mostly buy from Lazada for online products nowadays since it's more convenient to just wait for the item to be shipped. The site is also more secure. But... of course, there are still complaints like any other site. Going back to selling through the web, most of the products I sold were from overseas, in particular - Manjakani oak gall and some Revitol products which I also tried to market as an affiliate. I was able to profit from selling the imported items but it didn't last too long. I figured that it takes too much time - from ordering online, waiting for the items to be shipped here in the Philippines, posting them online, responding to queries (not all ends up buying anyway), shipping the items out (often through LBC), and all other tasks related to selling. While there are numerous successful sellers, some of which I regularly buy items from in Sulit (back then) and in Facebook (before), it's not as profitable as the hourly or even fixed price based gigs through freelancing sites. Another issue are the abundance of scammers on the site (probably why the popularity of Sulit has declined over the years). I've heard of fellow sellers who had received death threats after exposing how organized the scam activities were. The most I got was a phone call with the guy muttering p*tang*na mo! (roughly translated as f... you!) over the phone. Whether or not the scamming activity is organized, the pattern is indeed the same - multiple accounts posting fake positive feedback on their other accounts (as revealed by the same IP addresses), not agreeing to meetups or changing addresses and location to avoid meetups with a shipping only mode, sending a different item (fake or cheaper one) and payment methods which can be retrieved anywhere you are in the Philippines such as remittance centers (Western Union, Palawan Pawnshop, Cebuana Lhuiler, etc). So they can list a location as far away as Mindanao and then retrieve the remitted money elsewhere. Fake IDs seem to pass easily too. The same applies to mobile SIM cards used. I've joined or at least attended presentations for numerous MLM, network marketing, and even direct selling companies since high days. Some of which include Amway, Cosway, Avon, Boardwalk, Novo, Royale, Sante Barley, Vita Plus, Camella soap, Intra, Usana, Milk & Company, and more which I cannot remember anymore. In most cases, I join in order to receive discounts for products I normally buy from the company anyway such as Royale. While there are indeed overpriced MLM brands, the specific products I purchase are actually priced similarly with other brands in the market so I'd rather stick with the discounted (hence, cheaper) one. And yes, I did try recruiting and selling to people I personally know but to no avail. While I am never good with sales or anything connected to it - MLM, network marketing, direct selling and the like; I am doing good (or at least think so) in the web counterpart. It may be partly because the former involves personal interaction which I am not fond of while the latter is exclusive to the web (although chat, email, and web calls may sometimes be included). There are also techniques which can be followed online. Speaking of techniques, there is a guest post that I'd like to link for this purpose. See How to Decide if Network Marketing is Right for You. While there are negative stories attached to MLM - like the usual tagline that has now been epitomized into comic memes - "open-minded ka ba?" or the somewhat deceptive coffee or chat invitation from someone you haven't heard of for a long time, only to turn out into a business opportunity meeting (or rather a presentation), there are also a positive sides to this story (such as free food for one). I know of several people who made money from this method. You just might be the next one. Me? No.